Our very first call from Collectively came with a fun opportunity to work with HP. It was just the start of possibly our longest standing partnership with a brand. 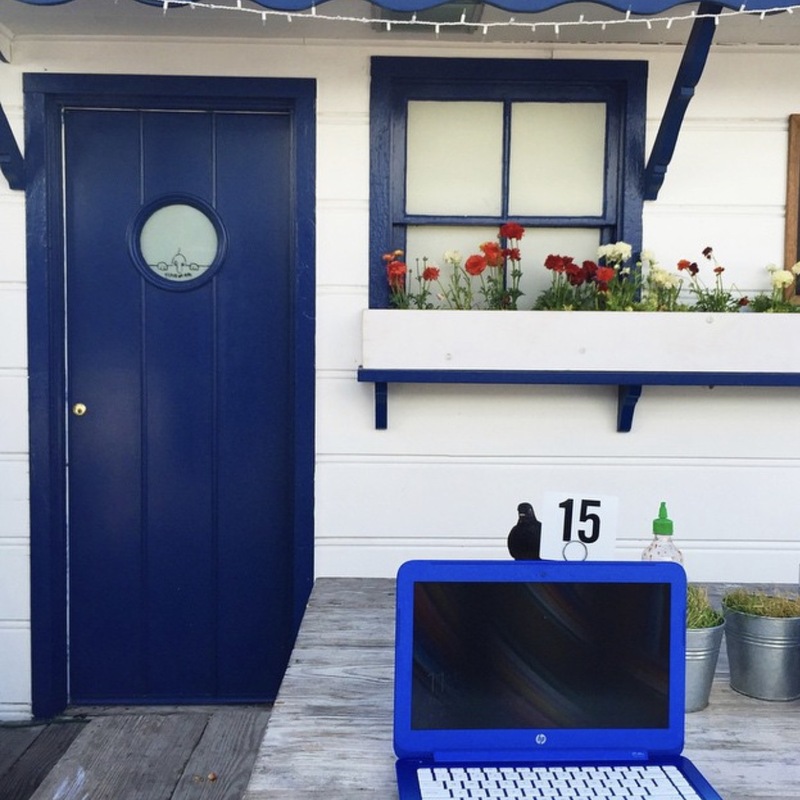 We didn’t know what was on the horizon for us with HP, but we started with the concept of working from a happy place! The idea was to explore balancing motherhood and work, and working from all our different happy places. Something we are always trying to figure out and achieve as busy working mamas. We took our laptops everywhere from home, the park, our favorite lunch spot and even the beach. We did a great giveaway with our social media following where they had to guess clues of where our favorite happy place was (Malibu Cafe of course). 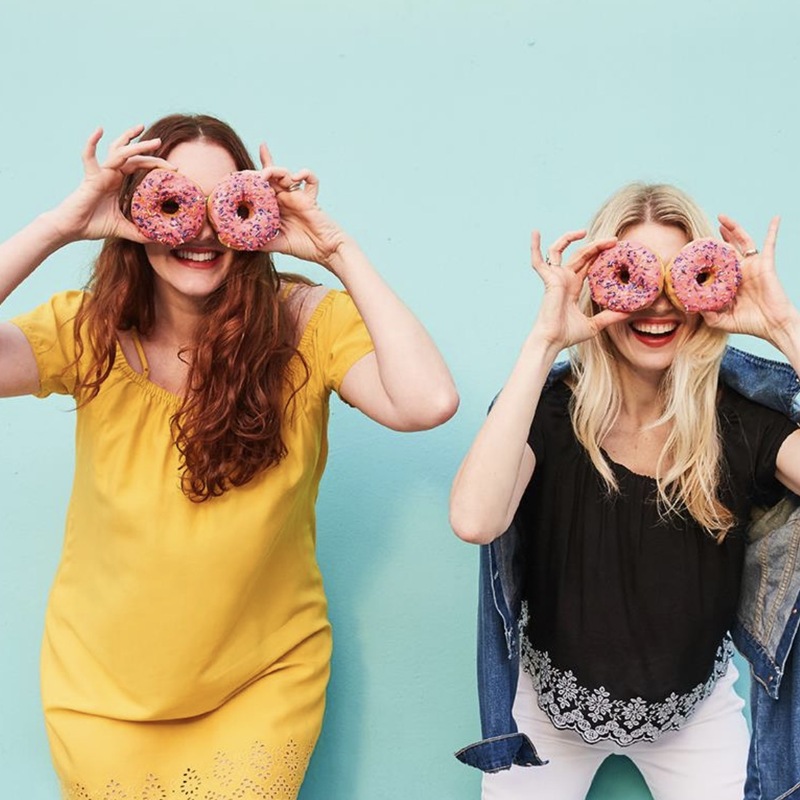 There was amazing participation, and we found it to be such a successful sponsored post. One of our favorite things about working with Collectively is that they are really in tune with our strengths as creators and are totally focused on pairing us with brands that fit like a glove! 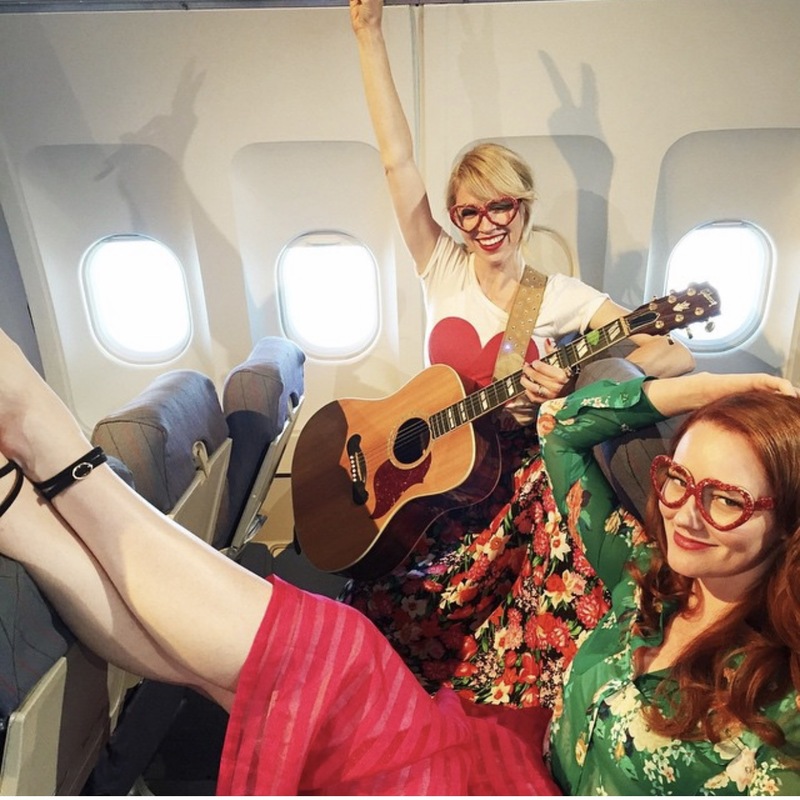 And often they have provided us with unique and out-of-the-box opportunities that have opened our eyes to a new side of The Girls with Glasses as live performers! For example, this opportunity was unlike any other we had really done before. It was a live event for HP at their buyers convention to see all the new product. Cause Ryan had remembered our silly intro songs at Alt Summit, they asked us to whip up a special song to sing to the people as they passed through the “color cafe” to take a look at the colorful HP laptops offered in nearly all the shades of the rainbow. We ended up writing a mashup medley of “Rainbow Connection”, “Yellow”, “True Blue” and “Lady in Red” and changed the words to talk about the HP laptop! It was silly and informative and we managed to crack some good smiles out of all those business professionals. We probably sang that song at least 40 times over the three days. Summer was under the weather and lost her voice but was a trooper! At that event we met someone who worked at HSN who loved it (foreshadowing). Thankfully, this was one of those opportunities that would propel us into a long lasting relationship with both Collectively and HP. Also one of the nights they had a big concert and dinner with Meghan Trainer. She was totally amazing and everyone was dancing and singing the night away! 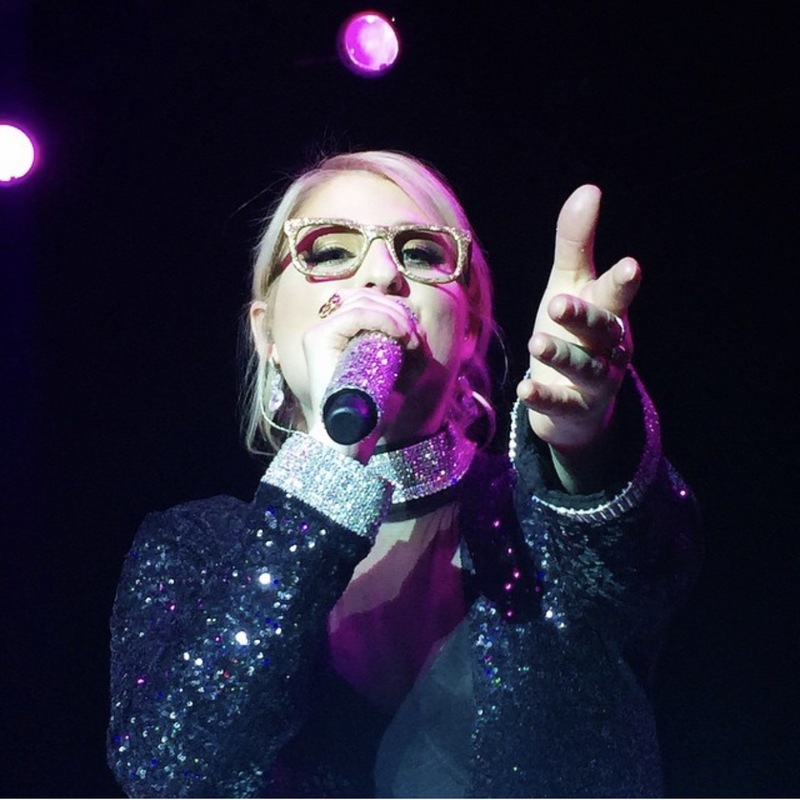 We were up front shaking our booties and having a great time when Meghan noticed the glitter glasses on our faces mid song and said “those glasses are so cute”. I impulsively took my glasses off and handed them to her on stage. She put them on and wore them for a few songs. We were so excited, however we kind of needed them back for the final day of the symposium, haha! So we found the stage manager and she got them back… but then we kind of felt like jerks for taking them, so we met her band later that night in a restaurant and we gave them the glasses back to give them back to her. LOL! 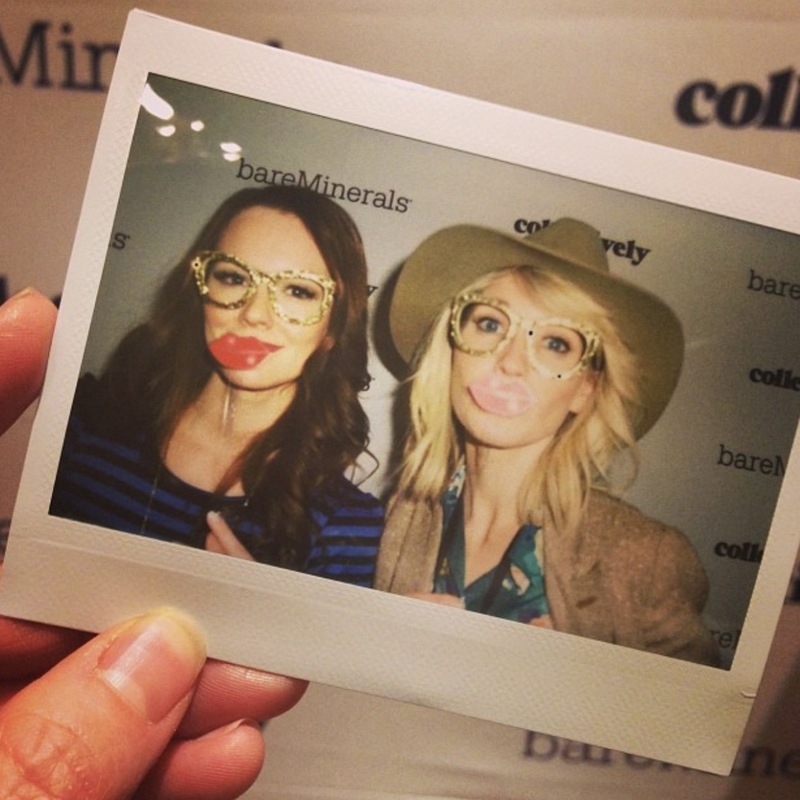 Luckily Summer had two pairs of the glitter heart glasses as back up so we were all good! A few months later we got another call from Collectively! HP was so happy with how it all went in Vegas that they asked us to join them in NYC for the Media Launch for those colorful Laptops. Of course there is that guitar again! 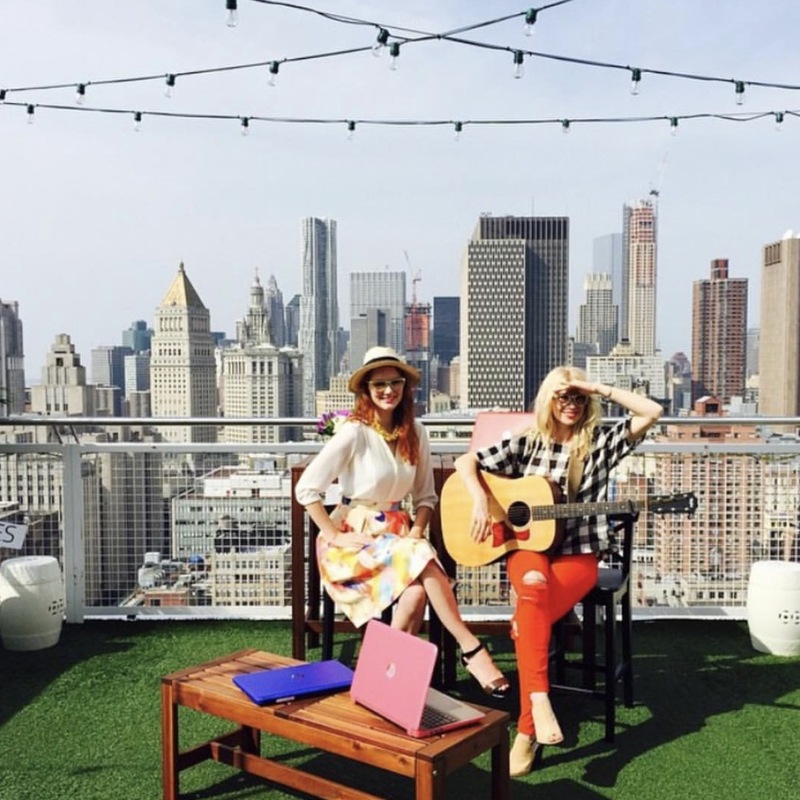 They asked us to perform our little Ditty of a mash-up for all of the attending press a-top the NoMo SoHo, and the view did NOT stink! We spent the morning overlooking the city on a clear day in June, singing and showing off some pretty colorful laptops and it was one of those days where we felt like we were really living the dream and we were indeed thankful. It wasn’t a bad gig thats for sure! Remember a few paragraphs ago I mentioned that we had met one of the good folks from HSN at the Vegas Show? Well here we are, and that is how this works friends! By the end of the summer of 2015 we found ourself in the swampy sweet town of Tampa to take part in one of our most fast paced, crazy, interesting, and awesome opportunities to date! 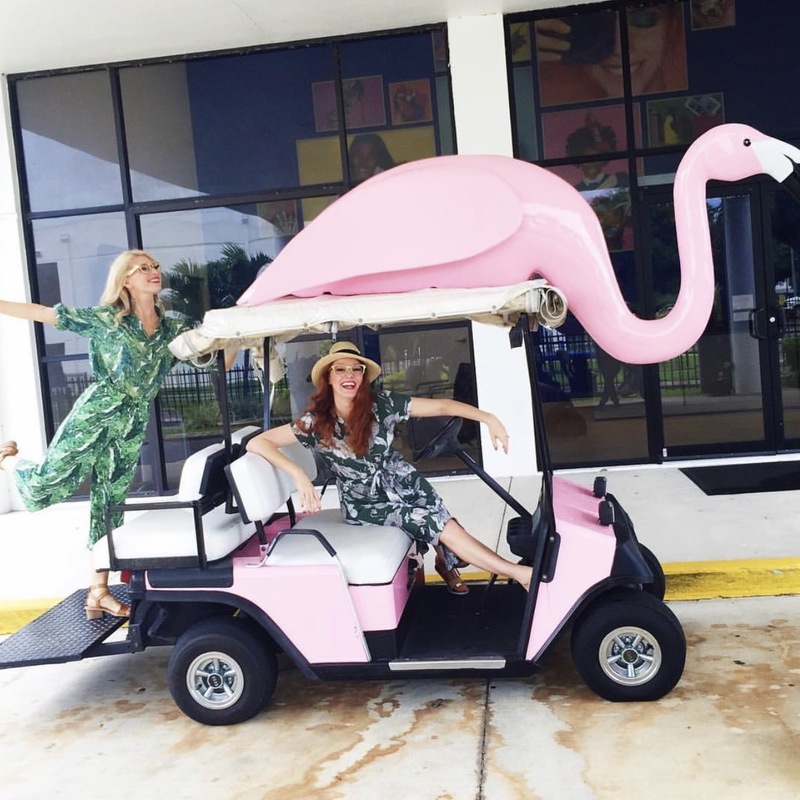 They flew us both out to be guests on HSN (Home Shopping Network) to be “color experts” and you guessed it, sing a song all about those colorful laptops again, but this time they wanted their own original tune for HSN, and you bet your bottoms that is what we gave them. Over 72 hours we were on the air probably 10 times, from The Beauty Report, to the Today show and the Daily Special, we were talkin’ and singin’ and sellin’ computers into the wee hours of the morning and WE LOVED IT! It was such a great learning experience for us. All the folks were so great there, and the Collectively team that was there became our good buddies. As they say at HSN, “It’s Fun Here”. 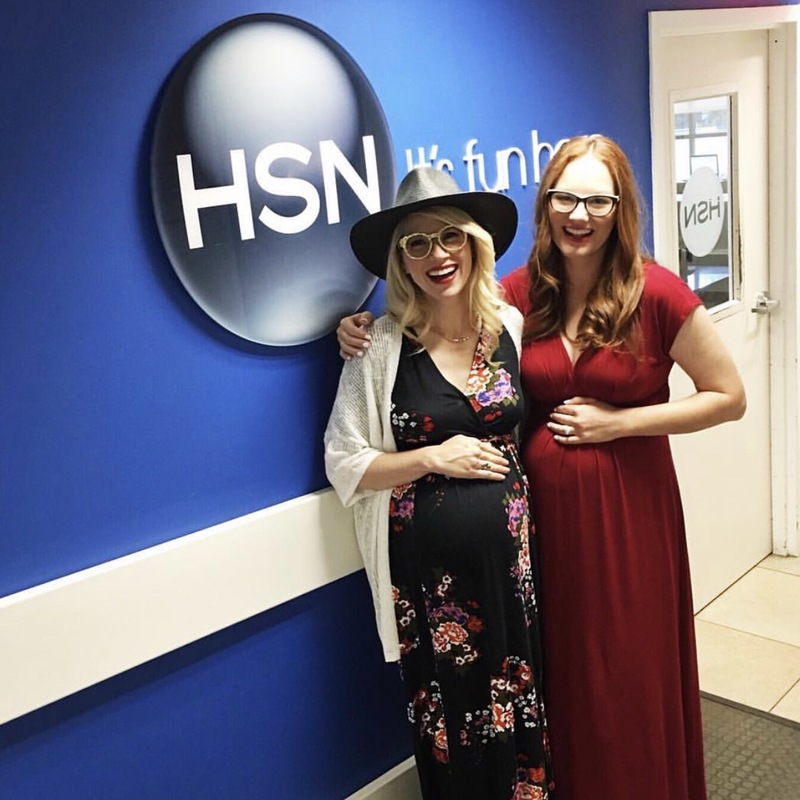 The following year, which would be last summer, Collectively, HP and HSN took our plea to let us come back seriously and called us to come talk and sing about color HP Laptops, except this time we were both super pregnant! So we were more of a quartet than a duo. I was 34.5 weeks pregnant and literally days away from the cut off to fly, but with the doctors consent and our floral jersey dresses we packed our bags and guitar and hopped on a plane to Tampa! My feet swelled up to the size of balloons while we were up in the air. 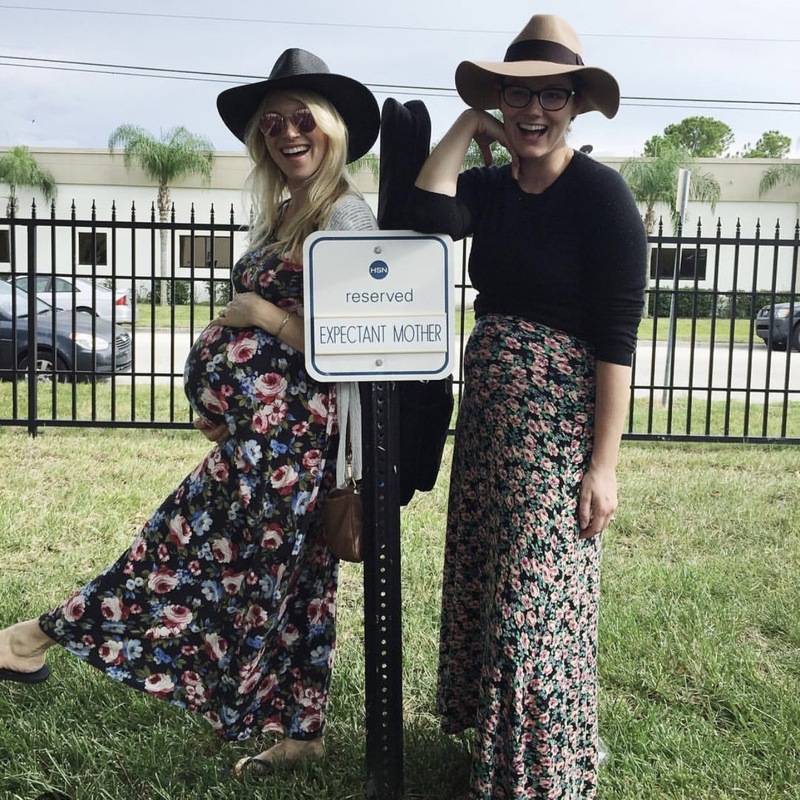 When we arrived to HSN, we saw a parking spot with this GLORIOUS Expectant Mother Parking sign! This is every pregnant woman’s dream! And if that wasn’t enough we were in the dressing room when we laid our eyes on the ORIGINAL girl with glasses, IRIS FLIPPIN IPFEL who happened to be there showing her new line of glamorous coats and jewelery! We geeked out quite hard over this legendary woman, and she was so funny and fabulous and didn’t seem to care. She kept touching my belly and asking me if I was gonna be ok, and she asked Summer if she could try on one of her red dresses. Of course Summer let her do so, and of course she looked nothing short of FRESH in it at 94 years young. 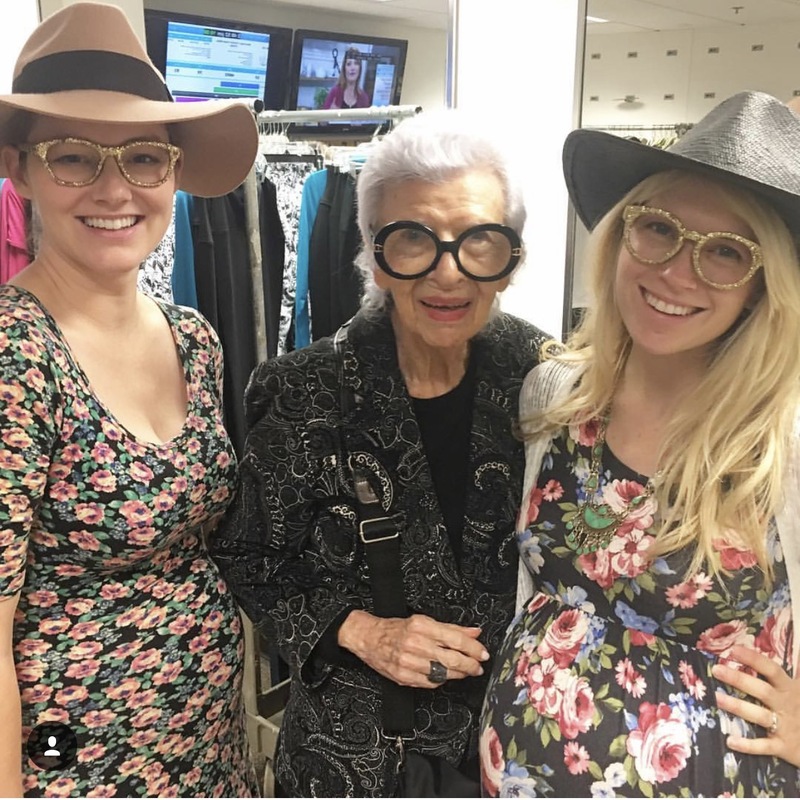 Meeting Iris was like a bucket list item… CHECK! Then we went on air to sing yet another song, and joined all the hosts we had made friends the year before to share our love of color and how we like to match our shoes and our lipstick to our laptops as well as a few other technical points like storage and terabytes. It was a little less stressful and scary this time around, since it wasn’t our first rodeo. 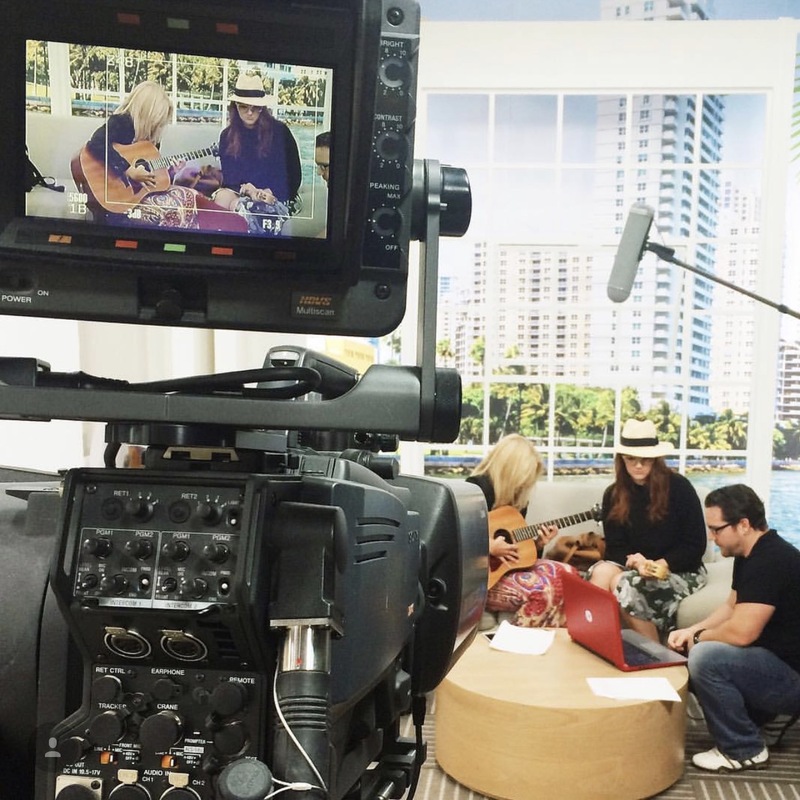 It was another fantastic and fun experience and we hope to hear from HSN again soon. Fast forward to just a few weeks ago when Collectively came calling. 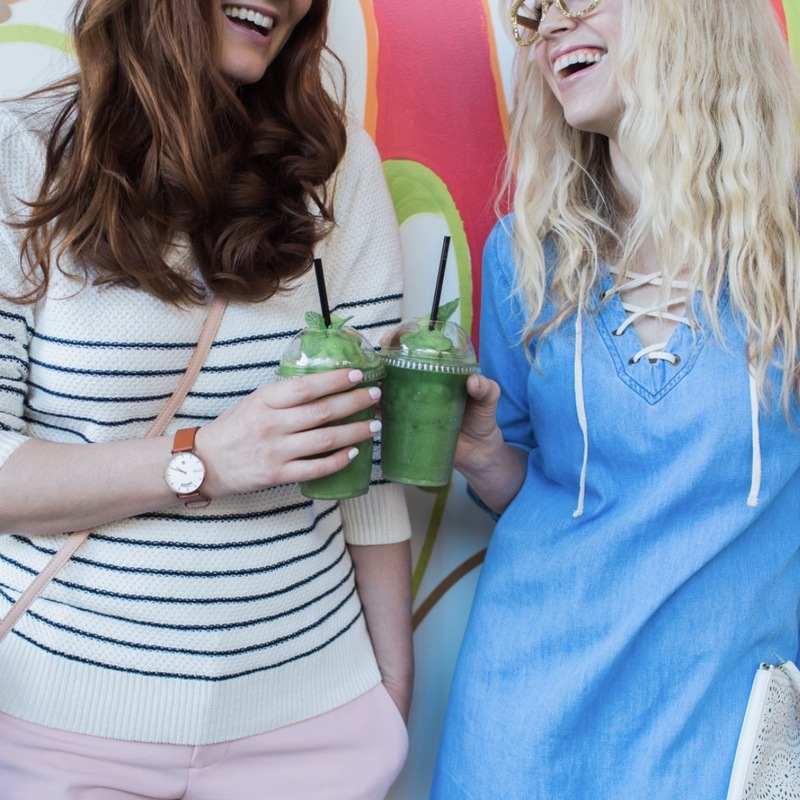 This time they asked us to take part in a super fun Social Media Campaign for Spring Fashion with Old Navy! Naturally Summer and I love clothes. 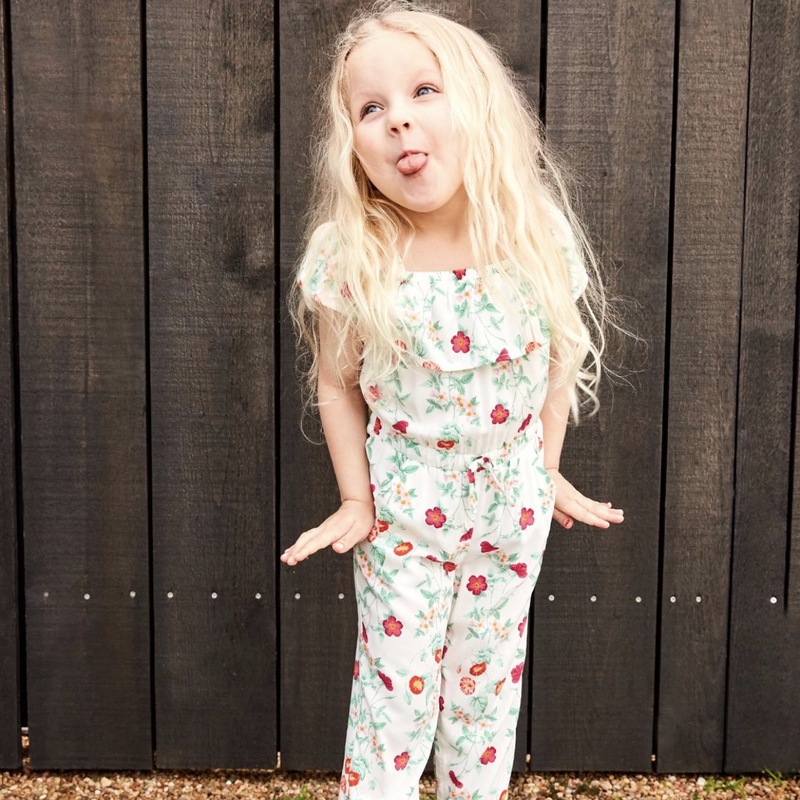 Also, I buy all of my kids clothes from Old Navy, and a good chunk of my own wardrobe and so we felt like there couldn’t have been a more organic fit. We found ourselves galavanting around the streets of Venice with an incredible crew for a photoshoot during of the sunniest most summery weeks February had to offer. We had the best time with a quality group of people. We are stoked to continue sharing images and posts from this campaign and fingers crossed that our paths cross with Old Navy again. Also, it was super fun to be able to involve our kids. London was quite the little ham, and surprisingly cooperative in front of the camera. 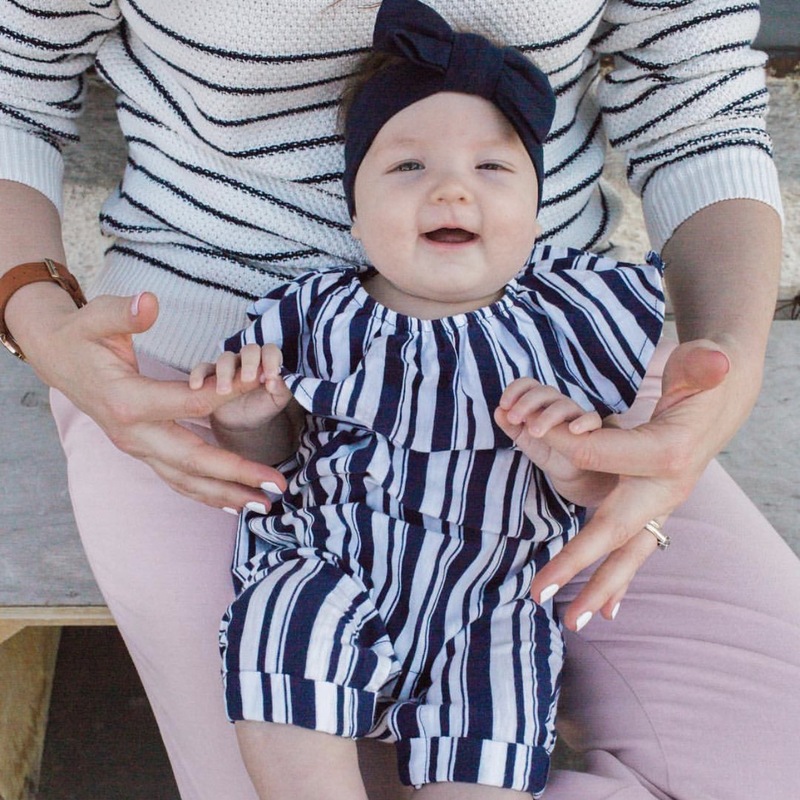 And just look at sweet little Nova in stripes. The cutest! The moral of the story is to keep showing up doing what you do and make those impressions. Be patient and yet proactive. Don’t take the easy route and do something special and someone might notice. And if they do, show them how much you appreciate them and do your best work when they call with the opportunities. Take good care of those relationships and you will find wonderful lasting results. Pardon us for getting mushy here, but we seriously can’t thank Collectively enough for being so good to us! For creating such an organic space for us as creatives and moms and for caring about us. We genuinely love the people we’ve come to know there. We love that we are always encouraged and able to be ourselves, and finding like-minded companies that appreciate what we bring to the table. We love how they work, It’s always organized, straightforward, and respectful. From meeting Ryan at the very beginning to seeing them grow their team into such a thriving success, makes us truly happy and we’re not the least bit surprised. And we are super honored to be a part of it. Happy Anniversary to you Collectively, and we hope you have many, many more! Thanks for all the adventures and for everything. We love your guts. I loved this. You’ve grown your business so organically, totally leading out in your creativity and uniqueness. The girls with the glasses totally rock. What a great connection with Collectively. All the best. As always, you two inspire me. I was a huge fan of Brooke on her American Idol days and have followed her along the way. Your videos always crack me up. This post, however, was a much-needed boost as I begin my art business/website/blog career. At 55, I finally built my studio (aka “she-shed”) and now am pursuing my entrepreneur dream. Still trying to create my website with its own online store of art and handmade aromatherapy dolls and also starting a blog about how healing art and scents can be.It is overwhelming and intimidating but exciting. We never know what God has in store for us but we do know it is all for the good. All the time. Thanks again for being true to yourselves and making the world a happier place.